Those who are looking for a feel-good stimulus story, notably members of the Obama administration, cite the recent initial public offering (IPO) in which the federal government sold off 28 percent of its General Motors shares for about $15 billion. When the government-owned shares went public, President Obama said: “American taxpayers are now positioned to recover more than my administration invested in GM.” From the headlines and sound bites, you might think that the government was in the money on the $49 billion that the Troubled Asset Relief Program invested in GM during the dark days of the Great Recession. To believe that the U.S. government made money on its GM investment is to imagine that former republics of Yugoslavia will get back together so that they can restart the production lines of the Yugo. In the GM story, there have been many winners and losers on the road from bankruptcy to IPO. For the most part, the losers include investors, bondholders, taxpayers, and the 65,000 workers laid off so that, in the showroom of American politics, the bailout money could look like a rebate. The winner was the United Auto Workers union, which delivered Ohio and Michigan to the Obama campaign in the 2008 election. Without the union's support in 2012, the president’s handling and maneuvering ability in the electoral college might resemble the torque on a Chevy Vega. The GM that went bankrupt in 2008 was not just a car company; it was also an unfunded pension plan, a bad bank (partial ownership of General Motors Acceptance Corporation or GMAC), and a health maintenance organization notable for padded bills. As it hit the crash wall, GM had negative equity, $88 billion in losses since 2004, 92,000 workers, 500,000 retirees, and 22% of a domestic car market that had shrunk to 13 million cars a year. What sleight of an accountant’s hand turned the originator of the Chevy Nova into an emerging juggernaut (maybe one with “soft Corinthian leather?”) that the market now values at $51 billion? Instead of letting GM go through Chapter 11 liquidation, and winding up the company according to bankruptcy laws, the U.S. government stepped in and allocated the spoils according to political rather than legal precedents. In theory, the move was designed to “protect American jobs.” What did these jobs cost? The immediate losers were GM shareholders (largely wiped out), and the holders of $95 billion in corporate bonds, now worth about $0.30 on the dollar. If you check the price of GM shares today, you will see them trading at around $34 a share. “Not bad,” I can hear you saying, recalling GM at $22 or even $8. But these are the new Government Motors shares; the old ones, which your grandfather owned, are trading for less than $1 on penny stock exchanges. Maybe the certificates are selling at flea markets? In the restructuring, the new owners of GM became the U.S. (61%) and Canadian (12%) governments, and the United Auto Workers (17.5 %), whose generous health and retirement packages would have been watered down or lost in a commercial liquidation. In the bankruptcy, the UAW retirees were moved ahead of the bondholders to the front of the disassembly line, no doubt because their rust-belt votes count more in presidential elections than those of bi-coastal hedge funders. Stakes in the new GM were granted to the union in lieu of cash due on health care and other benefits, which survived the reorganization. In the recent IPO, the unions netted $3.4 billion for a third of their stake. GM was also allowed to carry forward $45 billion in Net Operating Losses through bankruptcy, a deduction rarely, if ever, granted to other scrapped companies. Clunkers for cash? The company also got a $6.7 billion loan, at below market rates. And finally, to promote Chevy Volts, buyers of the new hybrid electric car are given $7500 in federal tax credits. Maybe Ford dealers can match the subsidy on their hybrids by throwing in a set of snow tires? The new GM is allowed to operate with an unfunded pension liability, which remains on the books to the tune of about $30 billion. Mark that claim to market (those accounting rules that did so much to collapse the likes of Merrill Lynch), and GM’s IPO stake is hardly worth $15 billion. The contrived GM liquidation also kept the auto maker from dumping about $14 billion in promises onto the Pension Benefit Guaranty Corporation, a nominally private company — the board, however, consists of the secretaries of Labor, Commerce, and Treasury — that, with government benedictions, backs up politically correct pension payments. The government originally threw $49 billion at GM’s cash guzzling problems and then forced another $100 billion on the market in losses. In exchange thus far, it has recouped $15 billion, for about half of it stake in the new GM. In Washington, that might pass for a good deal. It might also seem fair in a remake of The Godfather (“The Corleone Family wants to buy me out? No, I buy you out, you don't buy me out.”) Elsewhere, it sounds like a lemon. 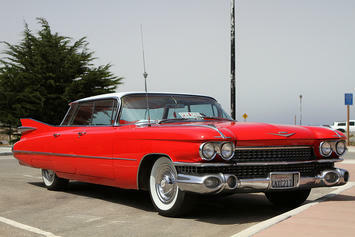 Photo of Classic Cadillac 2 by Shiny Things: "For-sale Cadillac parked in Morro Bay. How tempting is that?" Matthew Stevenson is the author of Remembering the Twentieth Century Limited, a collection of historical essays. He is also editor of Rules of the Game: The Best Sports Writing from Harper's Magazine . He lives in Switzerland. Submitted by david watson on Tue, 04/21/2015 - 11:57. Submitted by johnz308 on Wed, 04/15/2015 - 23:35. Submitted by johnz308 on Sun, 04/12/2015 - 14:32. Submitted by johnz308 on Sat, 04/11/2015 - 02:42. Submitted by johnz308 on Tue, 04/07/2015 - 12:47.